THE Great Indian Desert, Thar, is expanding, swallowing and degrading about 12,000 hectares of productive land every year. An alarmed Rajasthan government recently asked the state pollution control board to suggest how to arrest the land degradation and soil erosion. The board reviewed about 200 research papers on the impact of climate change on arid regions and recommended erecting tree fences on a large scale across the state. Some scientists fear the move would further deteriorate the desert's sensitive ecology. V S Singh, principal secretary of the Rajasthan Pollution Control Board, contends the studies suggest that human intervention must commensurate with climate change challenges in future to mitigate the impacts and adapt to it. His department has identified two major processes of land degradation: wind erosion and soil salinity, and suggests they can be checked through reforestation, conservation of forests and erecting shelterbelts, or tree fences. Shelterbelts intercept the force of dust storms, reducing soil erosion and stabilising shifting sand dunes, notes the review report prepared with the help of scientists from IIT Kharagpur and the Indian Institute of Science in Bengaluru. The trees would also act as carbon sinks, said Singh. The board's recommendation is based on research papers that studied the region from Bikaner to Ramgarh and said climate extremes in the region have ameliorated following plantation. Since the 1960s, the forest department has covered 38,000 km rows under shelterbelt by planting trees along roadsides, railway lines and canals. The board also considered the Green Wall of China, a series of forest strips grown to hold back the spreading Gobi Desert. Started in 1978, by 2009 the project had covered over 50 million hectares. 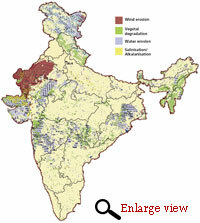 Consequently, dust storms in the region have reduced, claims the review paper. Shelterbelt projects like the Great Green Wall are not the appropriate way to check desertification, said S M Mohnot of School of Desert Sciences in Rajasthan. Mostly monoculture trees are planted under such projects, which reduce the diversity of forested areas, affecting native plants and animals. Even if local tree species are planted, the ecology of the fragile arid land cannot support such massive growth of plants, he said. Mohnot said land use is changing from pastures and rainfed agriculture to water-intensive agricultural land with borewells, thus, accelerating desertification. Agricul ture should be developed but only crops that require less water should be promoted. "Traditional wisdom of the desert needs to be given importance to mitigate desertification," Mohnot suggested pointing out that infrastructure development and mining are the prime reasons for land degradation in Rajasthan. Agrees geologist R S Mertia, who has studied sand dunes of the Thar Desert for more than 30 years. 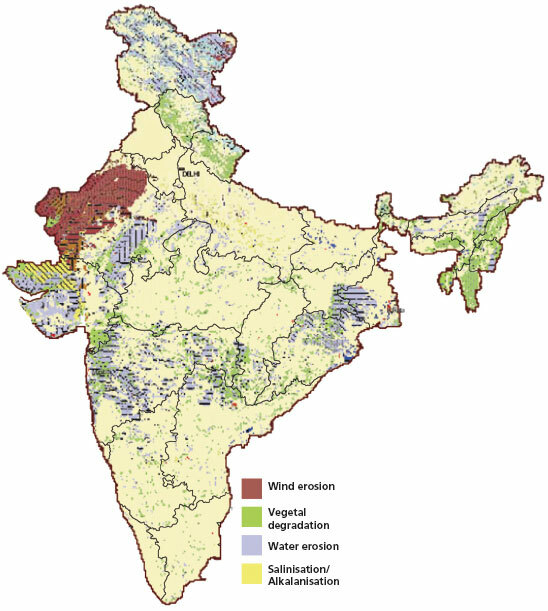 Along with his colleague Priyabrata Santra at the Central Arid Zone Research Institute in Rajasthan, Mertia analysed two major rangelands in Rajasthan—Jaisalmer and Chandan. The total soil loss during summer months from the overgrazed Jaisalmer rangeland was four times more than that at Chandan where grazing is minimal. "Rangelands comprise about 80 per cent of the Indian Thar Desert. Protecting them through controlled grazing can help check soil erosion and land degradation caused by dust storms," the researchers noted in the online issue of Aeolian Research on May 13. Mertia and Santra suggest increasing land under an indigenous grass variety, sewan, would protect the soil from erosion, while providing fodder to the cattle.